Gyromitra esculenta, one of several species of fungi known as false morels, is an ascomycete fungus from the genus Gyromitra, widely distributed across Europe and North America. It normally sprouts in sandy soils under coniferous trees in spring and early summer. The fruiting body, or mushroom, is an irregular brain-shaped cap dark brown in colour which can reach 10 cm high and 15 cm wide, perched on a stout white stipe up to 6 cm (2.4 in) high. 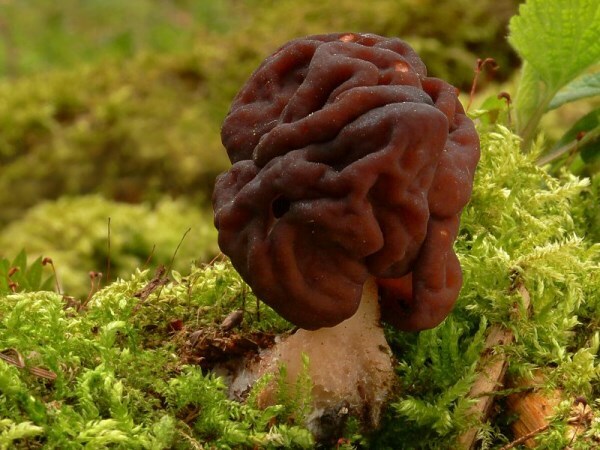 Although potentially fatal if eaten raw, Gyromitra esculenta is a popular delicacy in Scandinavia, Eastern Europe, and the upper Great Lakes region of North America. Although popular in some districts of the eastern Pyrenees, it is prohibited from sale to the public in Spain. It may be sold fresh in Finland, but it must be accompanied by warnings and instructions on correct preparation. It is eaten in omelettes, soups, or sautéed in Finnish cuisine. Although it is still commonly parboiled before preparation, recent evidence suggests that even this procedure may not make the fungus entirely safe, thus raising concerns of risk even when prepared properly. 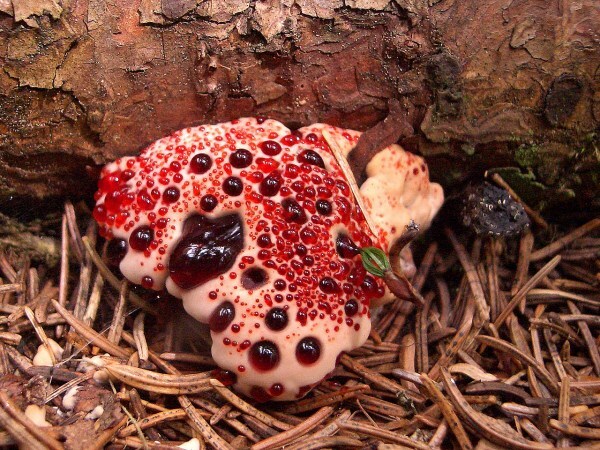 Allow me to introduce to you one of the more unusual members of Kingdom Fungi, the Bleeding Tooth Fungus, or Hydnellum peckii which goes by various names often referring to juice or blood. This fungus can be found in North America where it is more common in the Pacific Northwest and resides mostly in coniferous forests. The Bleeding Tooth also makes appearances in Europe and has recently been discovered in both Iran and Korea. Upon a first glimpse of the bleeding tooth fungus, one may dismiss the ruby-red liquid as the blood of some poor forest creature splattered across the white mushroom cap. When inspected more closely, it becomes obvious that the fungus is oozing liquid through its own small pores. 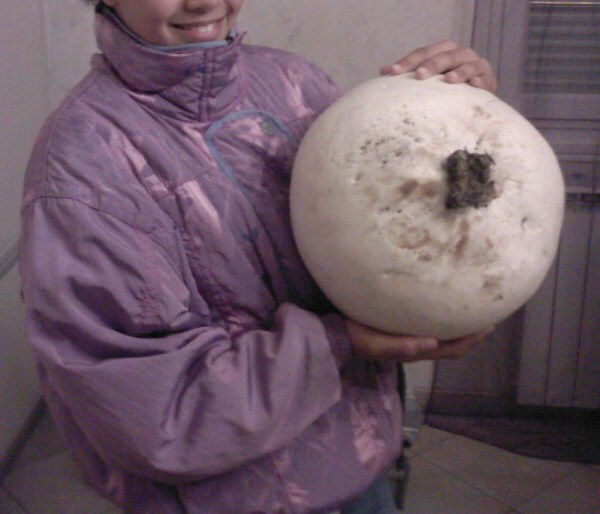 The giant puffball, Calvatia gigantea, is easily recognized by its size and shape. Typical specimens are about the size of a soccer ball, and more or less round. However, it can be much larger (a 5-foot, 50-pound specimen is on record! ), and its shape can be more "blob-ish" than round, especially when it attains enormous sizes. But it is never shaped like an inverted pear, since it lacks the sterile base portion common to many other puffballs. 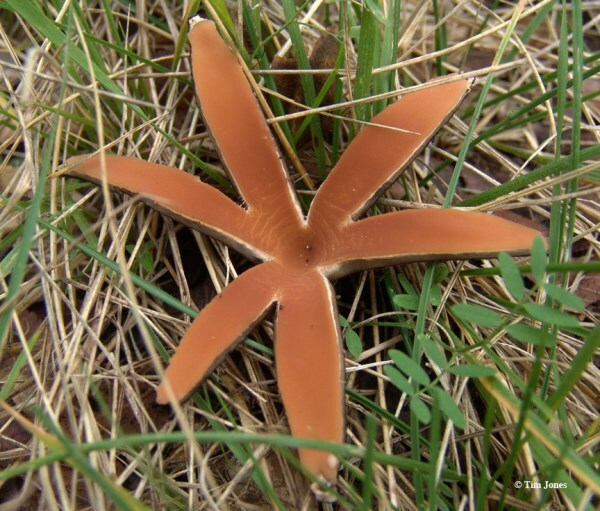 A star-shaped mushroom, called the Devil's Cigar (Chorioactis geaster) is one of the world's rarest fungi. It's also known as the Texas star. These fungi had been detected only in central Texas, two remote locations in Japan, and most recently in the mountains of Nara. The Devil's Cigar is a dark brown cigar-shaped capsule that transforms into a tan-coloured star when it splits open to release its spores. It is also one of only a few known fungi that produce a distinct whistle sound when releasing its spores. 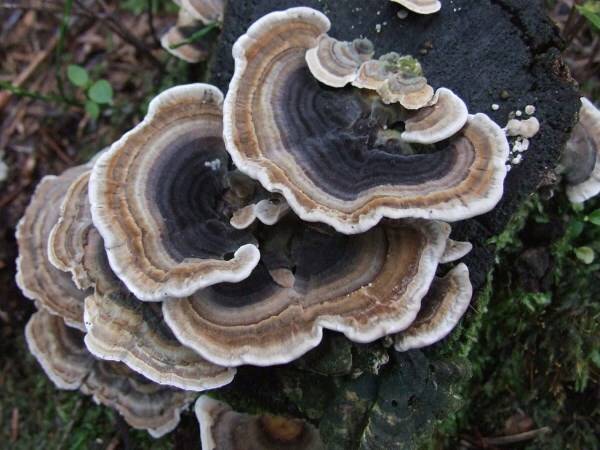 Trametes versicolor, often called the "turkey tail," has the dubious distinction of being the only member of the forest fungal fowl community not named for the full bird, but a feathery fraction. However, the chicken of the woods and the hen of the woods look nothing at all like chickens or hens, while the turkey tail does look (vaguely) like a turkey's tail. Who started this clucking menagerie of mushroom monikers, anyway? Entoloma hochstetteri is a species of mushroom found in New Zealand and India. 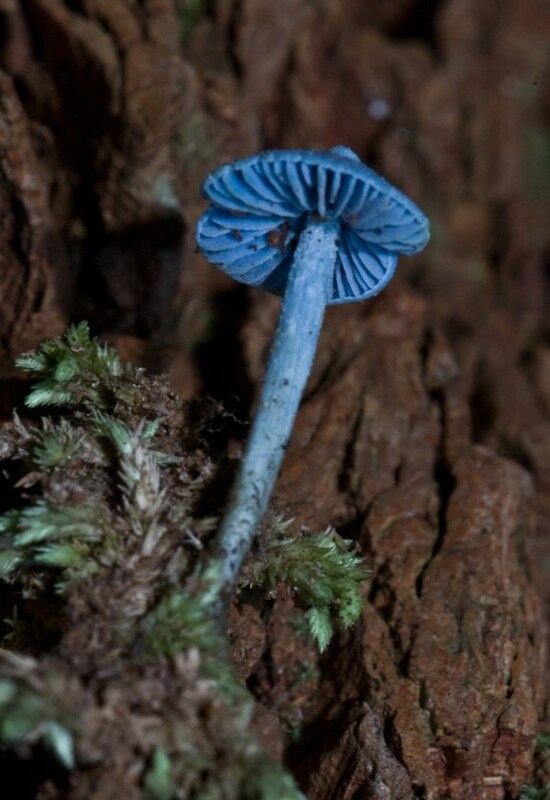 The small mushroom is a distinctive all-blue colour, while the gills have a slight reddish tint from the spores. The blue colouring of the fruit body is due to three azulene pigments. Entoloma hochstetteri is not edible, but whether or not it is poisonous is unknown. This species was one of six native fungi featured in a set of fungal stamps issued in New Zealand in 2002. It is also seen on the reverse side of the $50 bank note, issued by the Reserve Bank of New Zealand in 1990. 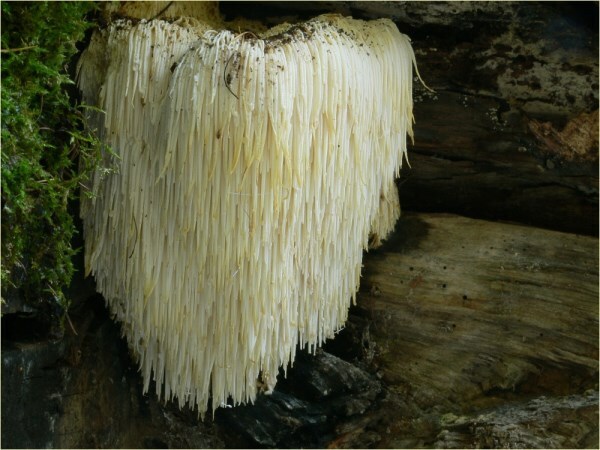 This mushroom that looks like noodles or pom-pom are known to a variety of name like Lion's Mane Mushroom, Bearded Tooth Mushroom, Hedgehog Mushroom, Bearded Hedgehog Mushroom, or Bearded Tooth Fungus. It is an edible mushroom in the tooth fungus group. In the wild, these mushrooms are common during late summer and fall on dead hardwoods, particularly American Beech. 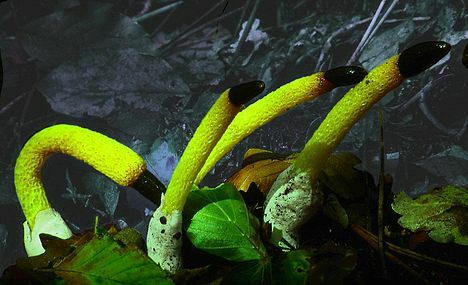 Mutinus caninus, commonly known as the Dog Stinkhorn, is a small thin, phallus-shaped woodland fungus, with a dark tip. It is often found growing in small groups on wood debris, or in leaf litter, during summer and autumn in Europe and eastern North America. It is not generally considered edible, although there are reports of the immature 'eggs' being consumed. No, you're not hallucinating; you really are seeing bright green mushrooms, but if you are partial to the odd magic mushie, these images won't faze you in the slightest. These neon green mushrooms, or Mycena chlorophos, to use the technical term, emerge during the rainy season in Japanese and Brazilian forests, scattering the floor with glowing spores. The bases of tree trunks, fallen branches, leaf litter and moist soil provide perfect breeding grounds for the mushrooms. Found mostly on Mesameyama island in Ugui, Japan and Ribeira Valley Tourist State Park, Brazil, the appearance of these garish looking fungi is due to bioluminescence, one of the weird but wonderful reactions that happen naturally in many plants and animals. Also known as the fly Agaric or the fly Amanita, the Amanita muscaria is a poisonous and psychoactive basidiomycete fungi, which is one of many in the genus Amanita. There are several subspecies, and each of them has a different cap color. These include the yellow-range flavivolata guessowii, formosa, the pink persicina, and the brown regalis (although it is now considered a separate species). 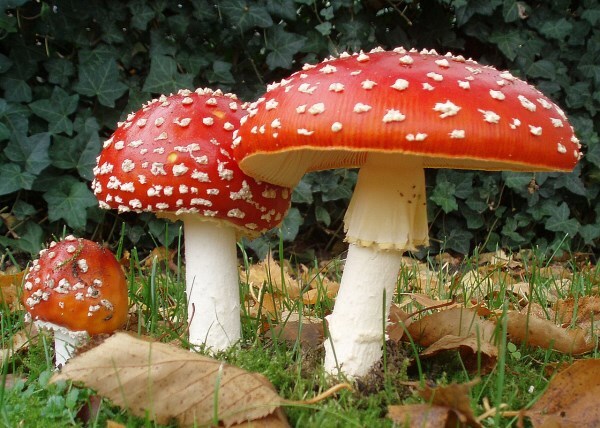 Fly Agaric's are one of the most recognizable and widely encountered in popular culture. They have been featured in children's books, films, garden ornaments, greeting cards, and computer games. This toadstool is associated with the famous book turned movie, Alice in Wonderland; the mushroom in Super Mario Bros., and more. It is also known as the mushroom of flies from due to Albertus Magnus' work in De vegetabilibus where he stated, “It is called the mushroom of flies, because crushed in milk it kills flies”.